My coworkers threw me a surprise baby shower last week. I was really impressed all of my friends and my wife kept quiet about it. I almost inadvertently ruined the surprise a couple of times, but thankfully I didn't. The best part of the shower was Heather and Abby being up there. I walked into the room and Abby got so excited. She screamed "I found Daddy" and ran up to give me a big hug. 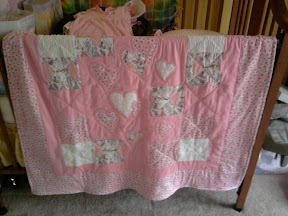 One coworker's wife made the new baby a beautiful handmade quilt. I'm really grateful to everyone at work who pulled this off. It was such a neat surprise.